Keeping your skin in great condition over the course of a year can be a demanding job, and women need body and skin care products that can help them look their best. 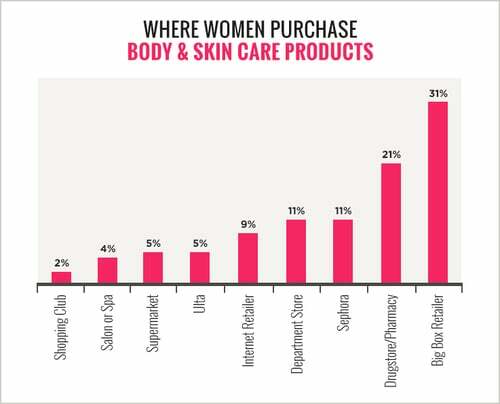 As part of the POPSUGAR Insights Q2 2014 beauty study, we asked women to tell us where they most frequently purchase body and skin care products. Overall, 31% of women in our survey frequently purchase body and skin care products from a big-box retailer like Walmart or Target. Twenty-one percent of women purchase these products from a drugstore or pharmacy. Sephora is a destination of choice for 11% of women when purchasing body and skin products, tied with purchasing at the department store (11%). Only 9% of women say that they purchase their body and skin care products via an Internet retailer like Amazon.com, and only 4% of women are purchasing these products at a salon or spa.